Yeah, well so is putting on a wig and pretending to be your boss. Gary: You think Director Sharpe deleted her own file? That’s crazy. Sara: Yeah, well so is putting on a wig and pretending to be your boss. 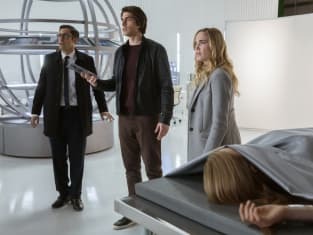 DC's Legends of Tomorrow Season 3 Episode 16: "I, Ava"
Director Sharpe! Director Sharpe? Director Sharpes? Permalink: Director Sharpe! Director Sharpe? Director Sharpes? Ray: What kind of world is this? Sara: I’m surrounded by my exes, Gary. This is hell. Permalink: I’m surrounded by my exes, Gary. This is hell.